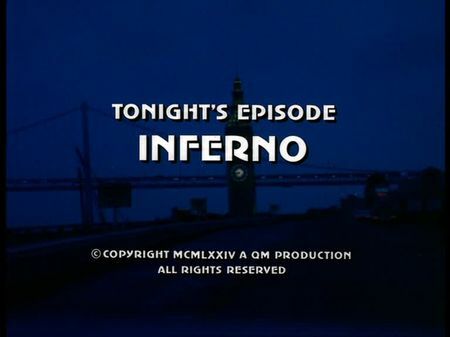 I have just added the screencaps for Inferno to the episodes' page. Two firemen are killed in a warehouse fire, one of them an old friend of Mike. Our two cops team up with Jack O'Moore, another old friend of Mike, and SFFD investigator. Their investigations indicate arson and either competition or insurance fraud, so Mike and Steve soon concentrate on the tenants who stored goods on the different warehouse levels. However, the case turns out to be obscure as all the suspects deliver good reasons for not having any benefit from setting a blaze. Another torching job in a harbour warehouse and the possessorship of allegedly 'useless machines' stored in the warehouse that burnt down first, finally lead Mike and Steve to Paul Wallick, a compulsive gambler who had obviously hired an arsonist to collect the insurance money to pay off his gambling debts. They need to hurry, however, as the arsonist threatens Wallick and his pregnant wife. As for filming locations, the burning warehouse in the opening scene is located at 118 King Street, known as the 'Townsend Building' today and located across the street from AT&T Baseball Park. Almost everything in this part of South Beach has changed over the past 40 years, but the brickstone warehouse still stands upright. Following the fire alarm, SFFD Fire and Rescue Trucks of Stations 38 (California Street) and 43 (Moscow Street) are responding, and soon after Mike - who 'enjoys' his Chili con Carne for breakfast at adjacent Carmen's Restaurant at Pier 24 (now demolished) - joins the site of operation. Most of the subsequent fire scenes are original SFFD stock footage and actually show at least two different buildings burning (with the smoke out of the King Street warehouse used for the acting scenes being the third one). Mike and Steve visit Jack O'Moore in the former Central Fire Alarm Station building at 1003 Turk Street (recently demolished). Marty Wallick's art supply store is located downtown on Sutter Street, whereas Paul Wallick's house can be found in Balboa Terrace. The suspected contractor for the second arson is caught in the former United States Post Office at Rincon Center on Mission Street (now closed), and following the final car chase with Mike and Steve, arsonist Jason's car flips over at 20th and Wisconsin.